Social media buzz can influence who wins elections, but it doesn't appear to impact voter turnout, according to an NM Incite study released Wednesday (NM Incite is a Nielsen/McKinsey company). According to the study, the candidate most frequently mentioned in social media won the seat 75 percent of the time. 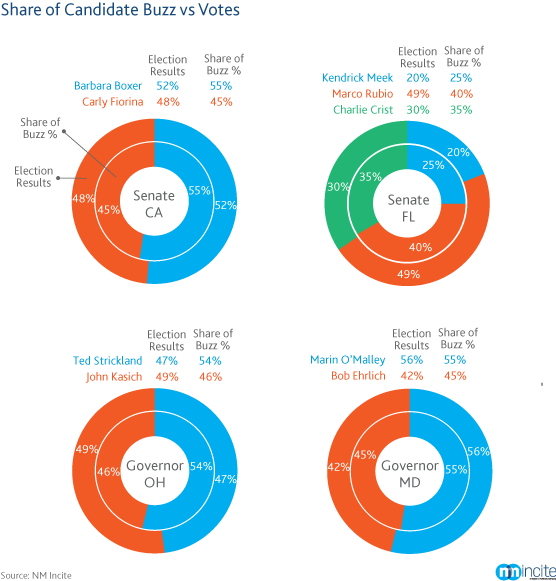 However, the candidate's share of the buzz didn't necessarily translate into a corresponding share of the vote. For example, in the U.S. Senate contest in Florida, election winner Marco Rubio had 40 percent of the buzz but 49 percent of the vote. In Ohio, incumbent governor Ted Strickland had 54 percent of the online buzz, but lost to John Kasich with only 47 percent of the vote. Social media buzz doesn't appear to be correlated to voter turnout. "Overall voter turnout during the 2010 midterm election was higher on average compared to prior midterm elections, but buzz doesn't appear to be a driver of voter turnout," NM Incite stated. "In fact, the two states with higher levels of voter turnout also had lower levels of online buzz about their candidates." Overall buzz about the political parties was split equally between parties, which reflects the election results: the Democrats won two seats, while the Republicans won two. Social media's impact on politics has been hotly debated. Some observers believe that President Obama's deft use of social media in 2008 helped him capture the White House. Others, however, argue that it wasn't President Obama's use of technology, but his message, that helped him win the election. One thing is certain regarding social media during this campaign season: Spammers have discovered it. An infographic released earlier this week by Impermium, the maker of a platform to fight social spam (and reproduced at left), outlines some tactics used thus far. GOP candidates are being promoted through the same accounts and using the same techniques as mainstream spammers. Some 60 percent of all political spam comes from fake social profiles with no user activity. Fake stories about candidates, issues, and positions are being posted up to 200 times per hour on thousands of blogs. Of all the candidates in the GOP race, the overwhelming amount of spam is focused on Mitt Romney. There's no doubt that social media will play a role in this year's elections. Whether that role will be marginalized by spammers or relegated to creating meaningless buzz, however, remains to be seen.